I found and bought the shirt above so many years ago that I have no recollection or record of its purchase. I know it has to be at least twenty years or so because for a long time it was actually in my closet. But I stopped wearing vintage on a regular basis long ago, mainly because I am so sloppy, and I was afraid of ruining things. About the same time I began collecting sportswear more seriously, and so the blouse was added to my growing pile of old clothes. I especially loved the label, Catalina Play-Abouts, but since it went into the collection I really haven’t thought much about it. 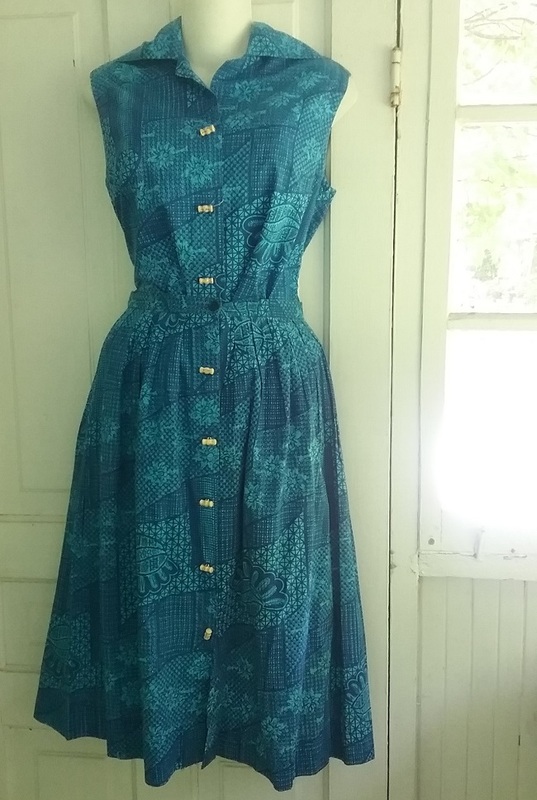 But, as it so happens, I ran across a set of blouse and bathing suit of this print on etsy. 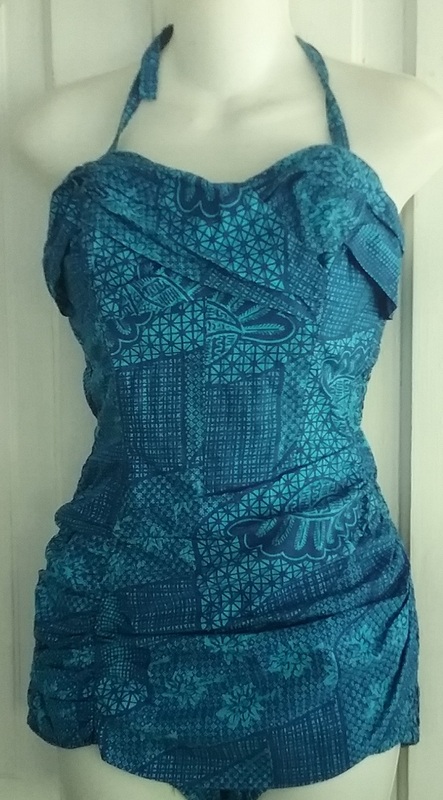 I really wanted the swimsuit, but because I already had the blouse, I decided to think about it before buying. As luck would have it, someone posted just the swimsuit on Instagram, but before I could buy it, the posting disappeared. By this time I was fairly discouraged, but not so much that I didn’t check the usual vintage venues. And there it was, on etsy, and a bit cheaper than the last one. My luck was improving. A few days later, another set surfaced on Instagram – this time a bathing suit and matching skirt. But the print was in orange and yellow. But that started me on a further search. 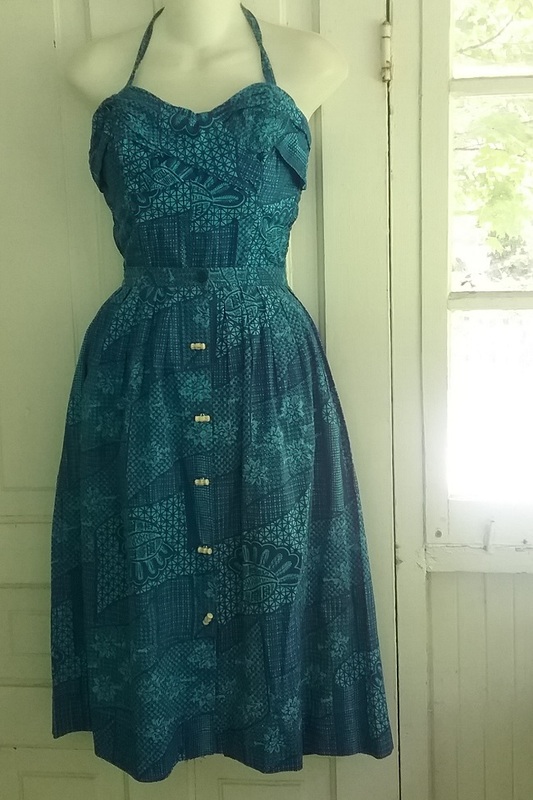 I went back to etsy, and that time a skirt, in blue, surfaced. That brought my set to three matching pieces. After posting the blouse and the bathing suit on Instagram, Liza of Better Dresses Vintage emailed some newspaper ads she found. The first one for Catalina Play-Abouts was dated 1953, and the last one was from 1960. 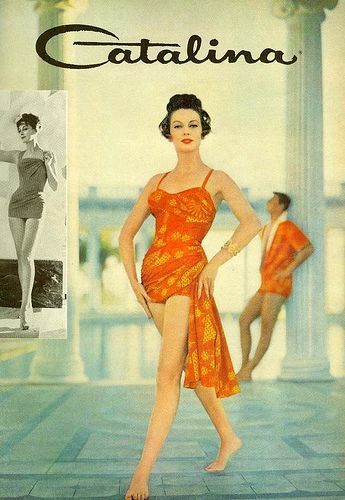 Best of all, one from 1958 looked a lot like my bathing suit. And even more important was the information that there were also shorts and pedal pushers in the Play-Alongs lines. After looking all over the internet, I finally found (on Pinterest) this image from a 1959 ad. I can’t tell what the model is holding, but it might be a shawl or coverup. 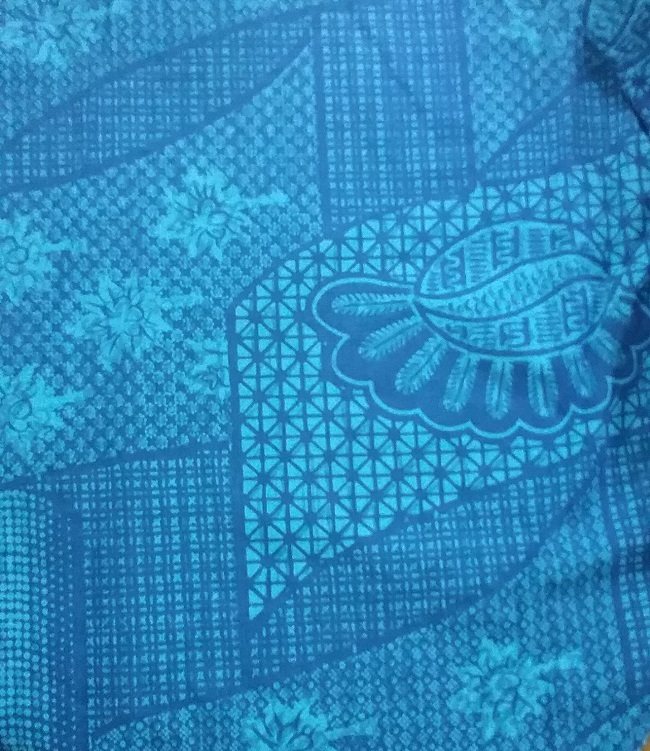 And I now know the print was made in a matching cabana set for guys. The addition of this tag is also interesting. 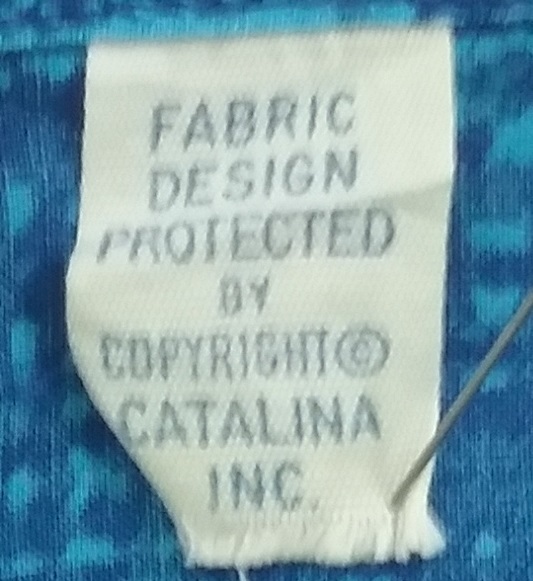 The fabric was apparently designed for Catalina, and there is also a copyright statement on the selvage of the fabric that I located in the skirt. And after looking at all the different photos of this fabric in extant garments, I noted that the bathing suits were not all the same design. There were three different suits that I have found. 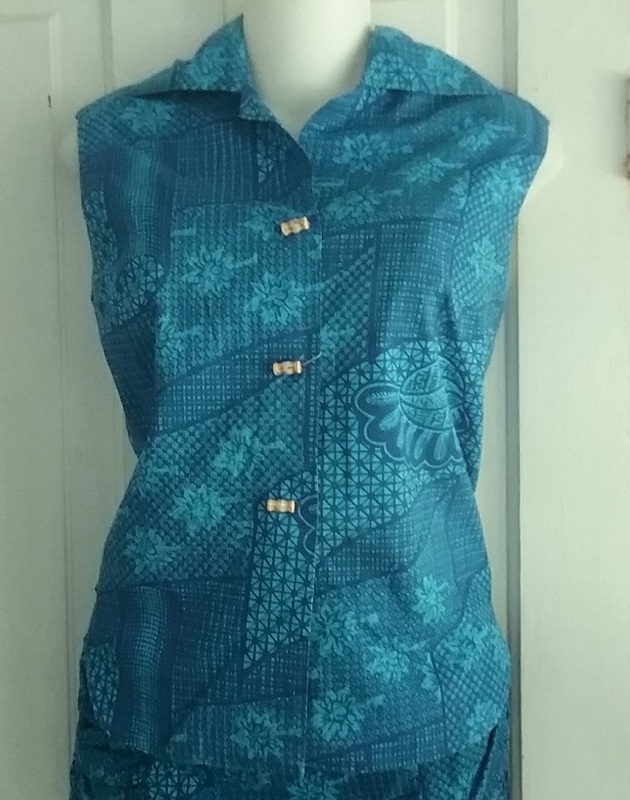 The buttons on the skirt and blouse are plastic, shaped and painted to resemble bamboo. It’s a nice touch. So the hunt for more of this line is on. I’m positive they are out there. I love this print. The twists in the bathing suits are back in vogue. Beautiful find! NICE! Love the provenance of the blouse! So practical to have coordinating pieces for weekend / overnight beach trip. “they” have no idea of this today. The Catalina ad is just wonderful. I remember the cabana outfits for men – my dad had one. The cabana boys are a different subject! This is an utterly stunning set!!! Fascinating amount of detail (both in your post/research and the clothes themselves). I’m assuming this was resort wear, and I have to wonder if husbands or boyfriends were willing to wear the cabana set matching their wives’ pool outfits – at the same time as their wives! My dad — he had a couple of cabana sets in the 50s — but NO WAY did they match! My mom didn’t even dress her daughters alike! Good luck in your quest – how nice to have assembled a set. I love your determination…and those are some fabulous buttons! Is the fabric cotton? I’d love to try making a bathing suit like that for myself! Yes, it is woven cotton.